VGB Welcomes NRG Smash Player Nairo! This week on the Videogame BANG! Podcast we have special guest, the latest addition to the NRG eSports team Nairo! Nairo is one of the very best Super Smash Bros. players in the world! A Meta Knight main in Brawl and a Zero Suit Samus master in Smash 4. This is the mystery player that Andrew Miller was talking about when he was a guest on the show a few weeks ago. We can’t wait to talk Nairo about making the switch from Team Liquid to NRG, the pressure on his shoulders to succeed with his new team, what it’s like being a professional gamer at the young age of 19, and a whole host of other awesome schtuff! Don’t miss this weeks live show on Twitch! 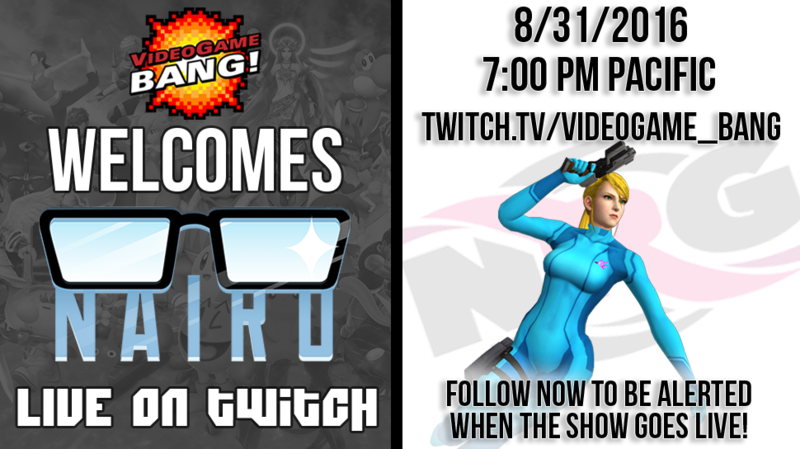 Be sure to visit twitch.tv/videogame_bang and follow now, so that you are alerted when the show goes LIVE!